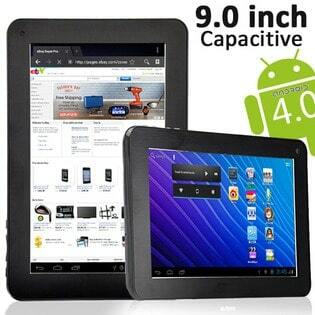 Today’s Deal of the Day at Sears is a 9” Android 4.0 ICS Tablet PC Capacitive Touch Screen with 1.3GHz 4GB, 512MB DDR RAM & WiFi Camera for only $109.99! If you don’t have a tablet, this would be the time to get one! I use mine when I travel and my daughter plays on it when we are at home. There’s lots of games for kids to enjoy. I also use mine to read e-books in bed, check emails and surf the net. And the apps!! I have so many and am always searching for new ones to organize my life and entertain my daughter. Pick one up for yourself or as a gift! Visit Sears now for more information and to purchase. This is a great deal ! I have been wanting to get a table t for my son and havent yet figured out which one i want to get it but i will definately have to check this one out .Thanks for posting this great deal !